Office 2019 is finally out and is available for download. If you have Office 2016 installed, it is high time for you to upgrade to Office 2019 as it comes with some of the newest features of Microsoft Office. If you are an Office 365 user, you can continue using Office 365 as it already contains all the features and updates which have been released in Office 2019. 1 What is Office 2019? Office 2019 is the stand alone version of Microsoft Office which comes with a perpetual license meaning that it is only one time cost while Office 365 users have to pay a monthly subscription cost. It is especially for those who do not prefer the subscription model and want to pay a one time cost for their Office needs. The price tag of Office Home & Business 2019 will be around $249 while you can get Office 365 for $99/year. Office 2019 will only run on supported versions of Windows 10, Windows Server 2019 and two most recent versions of MacOS. Requirements include .NET Framework 4.6 or later to be installed on the system. Some components may also require .NET Framework 3.5. You can check which versions of .NET Framework are installed on your computer using command line. Some Office search functionality requires Windows Search and an Internet connection, for example, Outlook search. In my opinion, Microsoft is slowly moving towards the subscription only model and may remove the perpetual license altogether. When you run the click-to-run installer, it will automatically install Office 2019 in the default location. This installer does not ask the user anything. You can’t upgrade from Office 2016 to 2019. 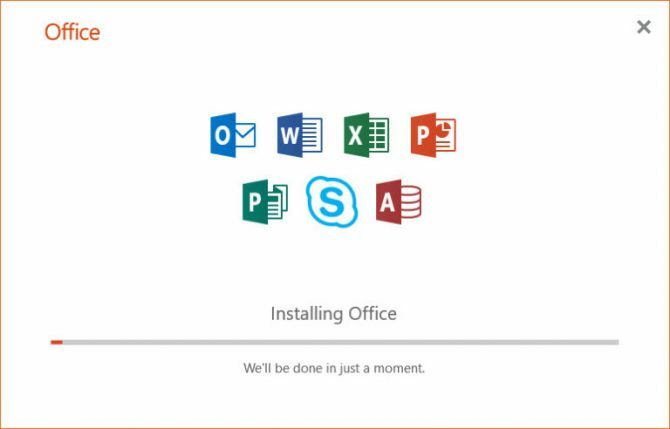 Office 2019 will install along side Office 2016 and even Office 365. But there is one caveat, although the installation of Office 2019 will complete, it will not run along side Office 2016 and Office 365. So if you want to install and work on Office 2019, you have to uninstall all previous Office versions including Office 365. Two new dark themes are supported, dark grey theme and black theme. You can change your current theme by going to any Office application File menu –> Account –> Office theme. New Excel features like new chart types, 2D maps, timelines, PowerPivot and PowerQuery improvements. A Focus Mode to let you concentrate on your writing by hiding everything including menus in Microsoft word. Focused Inbox in Outlook to show important emails on top of everything else. Microsoft Outlook 2019 does not include modern authentication protocols which I was expecting. I’m using Mailbird as my default mail application instead of Outlook. The following files are .IMG files which can be mounted like ISO files in Windows Explorer. Just double-click the IMG file to automatically mount and open the contents of the file. Run setup.exe to start the installation. Since it is a Click-to-Run installer, it will automatically start installing without asking any question from the user. The Office suite includes Word, Excel, PowerPoint, Outlook, Publisher, Skype for Business, Publisher and Access. If we have missed anything, please let us know through comments below. Thanks, but these are 32 bit versions, I need the 64 bit. I noticed there is no Project for Mac. Is there a Microsoft project for Mac? Yes I believe there is Microsoft Project for Mac but its download link should be separate than Microsoft Office as it is a separate product. What System Type will be required to run the Office 2019 Pro Plus English? Do I need to know that? or there is an option after I mount? I didn’t download it yet, just knowing things(3.30GB). Hello, unfortunately, the key does not work anymore. Please send a new ond. Your web site is a very useful site. I am looking for a Language pack for MS Office 2019 Pro Plus or Office 365. Where can I get it? Cual es la clave del producto! DOES YOU HAVE ISO OFFICE HOME & STUDENT 2019, OFFICE 365 2019 5 USER,OFFICE 365 2019 1 USER & OFFICE HOME & BUSINESS 2019 DO U HAVE JUST ISO ONLY. The installation is stuck at 51%. Help!! Will this ISO work with Office 2019 Standard key? Is it legal to use the product key of an English edition Office 2019 to install a Chinese edition Office 2019? If it’s only the installation key then that would be fine. it shows 2016 when that version or some leftover registry remains are still present and 2019 is not yet fully activated. go do some research before you blindly call out uneducated claims. I’ve try to install office 2019 but still don’t work what do i do…? i’ve edit on configuration.xml. Any suggestion for my case…? Any way to make this work with volume licensing keys? Or do you have instructions on how to build these .img files from the source .cab files? These are the retail Office 2019 installers. Let me check if I can find the Office 2019 volume license ISOs. Will post an update here if I find them. Hello, i need it too. Have you found it please? Looking for the same as well, have you managed to get any info? I uninstalled Office 2016 but when I install this img file, it still says Office 2016 Activated not 2019. After installation, my Microsoft account still displays “office 2016 activated” not 2019. Yes you need to completely uninstall Office 2016 before installing Office 2019. Office 2019 can be installed along side other versions of Office but it will not run by default. The only solution to this is to uninstall the other Office version. I did this, and still says Office 2016. Let me install it on a new test system. Will share the test results with you ..
You will need to use the Microsoft uninstall tool to uninstall Office 2016. Once uninstalled, reboot your Computer. I did the same and got mine working.